NWLL is continuing with the Rally Cap Program at the T-Ball Division. The program has been designed specifically for young baseball players and aims to increase interest in baseball. 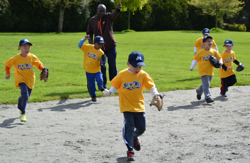 The Rally Cap Program is one of the outcomes of the Long Term Athlete Development Program developed by Sport Canada and is supported by Baseball BC and Baseball Canada. T-Ball 1 - Ages: 4 & 5 year olds who are playing baseball for the first time. T-Ball 2 - Ages: 5 & 6 year olds who want to learn the basic fundamentals of baseball. Players from T-Ball 2 may be selected to play in the T-Ball Jamboree, held at the end of June. 1) Create an environment in which children and adults can have fun with baseball. 2) Teach baseball skills, rules and strategy to our players. 4) Promote increased self-esteem among Rally Cap children and adults. All Rally Caps will be done on an individual, not team, basis. A player must achieve the prescribed goals in order to receive their cap. There will be 2 Rally Cap sessions per season.